There are a lot of myths flying around about Issue 9 as we approach the election. It seems every stage of the process has been designed to confuse and deceive voters. I thought the use of "deceive" was a little harsh until I heard COAST defending their wording of the ballot issue, now I feel very comfortable with it. Now I am not saying I have heard all these myths from COAST. Some are only implied in their rhetoric, and some I have heard from others. I am also sure you can add more in the comments, please feel free. I don't think we need to belabor this point. We have already covered COAST's use of the "Queen's English" (their term for technical legal latin abbreviations) that make the wording appear to focus on streetcars and trollies, while covering any light passenger rail. I know COAST likes to mock the issue of it affecting the train at the Zoo (even though it would). I am more concerned of the impact on passenger rail systems like the proposed high-speed rail connection in Ohio. If I really wanted to be more conspiracy minded I would pursue the fact that most of COAST's members live in the burbs, and the effect of this issue could cause the rail to stop in one of those communities rather then go into the city. All in all, if you are against the Streetcar, voting Yes on 9 is like going after a fly with a sledge hammer. It's kind of your worst work-realted nightmare. The meeting to determine when we need a meeting. The only thing a Yes vote guarantees is that we will have a vote if the city wants to build a Streetcar, or use public funds to bring high-speed rail into the city, or expand the train at the Zoo. Seems silly, doesn't it. 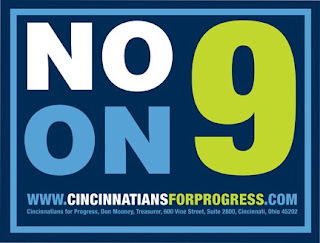 Now to be fair, "For Cincy Jobs" seems a bit of a stretch for the No on 9 signs, but Yes on 9 will not stop the streetcar. I find it amusing that they wrap this issue in the concept that Yes is about democracy. "We Demand a Vote". Well, we have a vote. It's called representative democracy. We vote representatives into office, and they make decisions. If we don't like those decisions, we vote them out. We do this because a majority rule on every single detail of public issue is truly counter-productive. It is not because people are too dumb to vote on it, it is because people don't have enough time to fully educate themselves on every project. Rail is going to require a big-picture perspective on things. It is going to require that the decision makers balance a number of issues. It does not work well in a sound-bite popular vote. We can already see how folks are trying to deceive voters. FACT: Seriously? The problem in Cincinnati is we move too FAST on things? It will slow down the process by creating extra hurdles, but is Cincinnati's problem that we move too fast, or we move too slow? We all know the apocryphal Twain quote. And wow, Fountain Square west moved SO fast. And that Bank's project... if we could have only slowed that down. You remember when we all voted for the Fort Washington Way project? And on the proposed expansion of 75? When are we voting on the Brent-Spence Bridge? Oh wait, we don't. The government heavily subsidizes the road system. I'm glad they do, but the gas tax isn't paying for all of the cost associated with the system. Frankly I could care less about the 75 expansion, I don't need to ride that section of 75. So why don't we vote on that? Because we need folks to look at the big picture, and make planning decisions that benefit the whole region, not just me. Have we mentioned the scope is beyond streetcars. Even Bill Cunningham expressed dismay over the wording of Issue 9. Listen to the audio. He thought it was a bad issue (though he said he won't be voting on it since he lives out of the city). And he cannot stand the streetcar. There are a lot of council members and candidates who are against the streetcar, who are very much against Issue 9. More Half-truths. 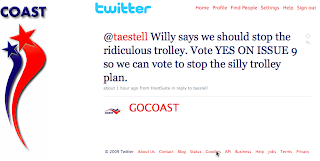 Willy DID say we should stop the ridiculous trolley, but he also said Issue 9 was bad. This is yet another purposefully misleading statement from COAST. 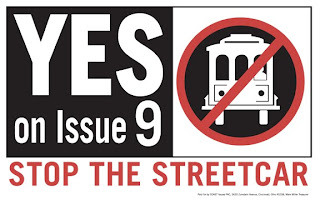 So, in my opinion, whether you are for the streetcar or not, you should vote No on 9. It is a bad piece of law we don't want in our City's charter. Thanks for this great mythbusting post. And, thanks for the picture of the yard sign. I hate the yard sign -- it's so misleading. Issue Nine loses more credibility every day. They were hoping to slip something in without being noticed, but the more daylight/publicity/debate brought to this issue the better, especially to the non-blogging public. If the vote was in Spring, they would have no chance of success, but since it is next week, we still have a lot of work to do getting the word out. Great post. And I know for sure there are certain jobs that will be gained if we vote 9 out (e.g. Stacey & Witbeck's regional office). Well, I have to say that this is about the best write-up I've seen on the issues involved with the streetcar vote. (I appreciate the lack of name-calling, which seems to pervade most posts on the subject.) But in the end I just think 180 mil is a whole lot to spend on a speculative streetcar project that bases most of its economic benefits on cities that don't closely parallel Cincinnati, and that took place a few years ago (or more) when the economy was a whole lot better. If the issues fails (i.e. the streetcar can go forward) I won't lose any sleep, but I still believe it's a bad way to spend other people's money. If Issue 9 is deafeated the streetcar still will not happen unless a few other big hurdles are crossed, such as getting FTA Funding..
@kid-cincy I still stand by the fact that Issue 9 is not JUST about the streetcar. Voting for it to stop the streetcar is going to hurt far more than the streetcar. But the COASTers aren't stupid, they are trying to tie it closely to this single consequence. About the name calling, I find it fascinating that coast has begun calling us progressors, turning progress into a dirty word. To me, this says mountains about where they are coming from. Of course I'm not above it calling them cave men. i'm worried that all of us bloggers and blog followers are living in a bubble and that your average cincinnatian still doesn't know the myths surrounding this issue and will vote yes because coast tricked them in to it. ugh. Take some comfort in the fact that a co-worker from Westwood, super anti-streetcar came in the other day and said, "wow that issue 9 is f'd up" why couldn't they have just made it about the streetcar? He is active in the westside PowerPac, he doesn't live in a vacuum or make decisions on his own, so I'm sure if he feels this way all the neighbors he talks to on the sidewalk are feeling the same way. Well, if he can't make a decision on his own then I don't know if I'd put much weight into what he has to say. I'm not so sure. I agree that most people have no clue what issue 9 is about, and honestly probably don't care, but I think they'll lean towards voting No if they don't know how to vote. In my opinion, voting Yes on something means that I believe in it, and I'm not sure that voters who might be confused or unaware of the issue will necessarily vote Yes. And I don't buy the whole notion that people are "tricked" into voting for something. Sorry, but to me that suggests a little arrogance on the part of the person making the statement. If the people get up off their butts and bother to go to the voting place (which, what, 60% don't even bother?) I'll give them the benefit of the doubt that they have actually put a little thought into what they are doing. I agree with you that people tend to vote NO if they do not fully understand the proposal, however who hasn't had the feeling of regret of their vote after later figuring out more fully what it entailed. I would guess many people who voted for the half-cent sales tax for the Reds/Bengals stadium have that regret and felt tricked. 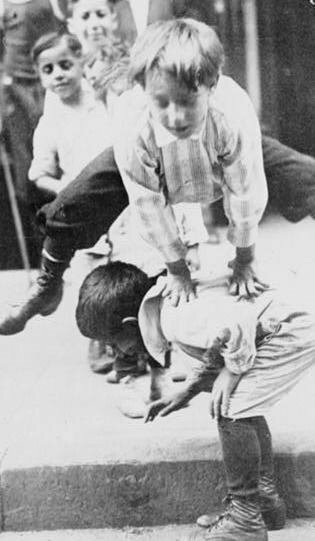 In fact, that sense of feeling tricked has hurt levies in Hamilton County ever since. @kid-cincy here is the point on "tricked". How many issues will we vote for on election day? Not EVERYone will research EVERY issue. I think it is an important responsibility, but not everyone does it. When they read the ballot language they will see e.g., a trolley or streetcar, they will recall the signs that say "Vote Yes on Issue 9 Stop the Streetcar" and they will go, I don't want no stinkin' streetcar, and vote yes. Or they will vote no because they WANT a streetcar. THAT'S why I think it is important to let folks know what ALL the consequences are re: Issue 9. So they can make an informed vote. Hey, at least there's no regret on my part about the stadium votes-- I'm proud to say I voted against them (I can't remember now if it was one or two separate issues). I love the Reds, and I'm a fair-weather fan of the Bengals, but I had no stomach for taxpayer-supported stadiums. Plus, I was really hoping the Reds would go to Broadway Commons. I'm really dreading the idea of a casino going there. I'm with you kid-cincy - a casino at Broadway Commons would be terrible. Then again, a casino anywhere would be terrible, imo.